Good news for the sail transport movement: Fairtransport is actively looking for more ships. 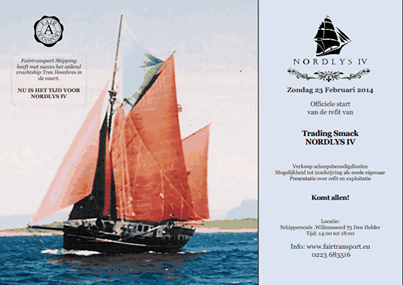 At the end of this report is a section on the latest vessel the Nordlys and its acquisition and refit. Our last report on the Tres Hombres current epic voyage was on Dec. 29, recounting that she called at Belém, Brazil. Then she sailed to the Caribbean Sea via Barbados, and visited Grenada on Januarly 29 to load 25 000 bars of Grenada Chocolate Company's superb product. 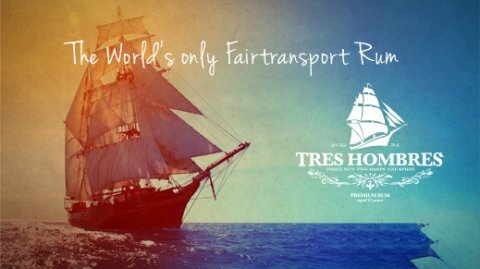 Now Tres Hombres has arrived in the Domincan Republic. The crew has just loaded (as opposed to got loaded on) 20 barrels of its very own brand of rum. Additionally, cocoa (powder, beans and butter) and some lovely fresh Tres Hombres Coffee were taken on. Sail Transport Network inquired of the ship's company Fair Transport whether there would be room for the usual tea cargo taken on in the Azores in a few weeks. The response from Jorne Langelaan, one of the the firm's founders and captains, was "We may have to fill the captain's cabin with the tea because the ship is full! 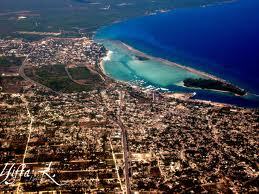 We had to turn away business in the Caribbean because of growing demand for our sailing cargo." After leaving Boca Chica (DR), the Tres Hombres sails to Freeport, Bermuda, then to Horta in the Azores, then London, then Amsterdam, and home port Den Helder (NL) -- with a visit to Oostende, Belgium before returning to Den Helder. "While in port, we helping the crew make the ship ready for sailing and received training for climbing the mast rigging and line locations and purpose. Delicious organic chocolate was picked up in Grenada, and we toured the Grenada Chocolate Company, nearer the east side of the island. The employees of the company were so gracious they showed us their cocoa plantation and provided us a scrumptious dinner that was also the national dish! On our days off, we enjoyed seeing the beautiful country and people of Grenada, enjoying their vans that act as taxis, local delicious fare, and seeing and jumping from the Annandale waterfall. Now on the high seas of the Caribbean, the real fun has begun. We have enjoyed excellent and reliable easterly winds, sunshine, and a spot or two of rain. We have adjusted our sails by wearing the braces, but have not performed a tack or gybe since the voyage started in earnest due to the winds not changing and a well planned course to start. Attached is a press release regarding the arrival of the sailboat "SV Tres Hombres," visiting the Dominican Republic for the fifth time. The boat will take charge of and bring products to several countries in Europe for the fair trade markets. This is done without doing damage to the environment by CO2, because even though you have 32 meters and over 30 tons in capacity, there is no engine. 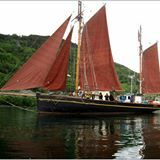 Their owners promote fair transport through traditional vessels. In the port of Boca Chica the good products of the island, rum, cacao beans and coffee are going fill the hold and will be sailed to the Europian customer by wind only. ‘From A to B emission free’ says the motto of Fairtransport b.v., founded by the three sailing friends Andreas Lackner, Arjen van der Veen and Jorne Langelaan, who started a revolution in naval cargo transport by making it their goal to significantly reduce the pollution caused by the engine driven mercantile marine in bringing back wind powered cargo ships on the world seas. Not only traditional ships like the Tres Hombres but also competitive hybrid vessels with high-tech sails and a low emission enige. The Atlantis Foundation, the Fairtransport umbrella organisation, participates in the development of such a vessel, the Ecoliner (see European Union's SAIL consortium: bringing on the future). On this trip Alexandra Geldenhuys is sailing and cooking. She is a representative of the UK sail cargo shippers New Dawn Traders. They retrace historical trade routes, and write stories of what trade was and is currently, and what the future of fair transport could be. During the stay in Boca Chica the public is invited to visit this special ship and to get informed on this unique project by captain Lammert Osinga and his crew. More information can be found on svtreshombres.com, newdawntraders.com or during the visit of the ship. "This voyage opened up a new market for the Tres Hombres and future sail cargo ships. Brazil is a big market, plus there's Norway, both to and from. For Brazil, we bring wine and olive oil, and our contacts there export superfoods and coffee on our ship. At this moment we are loading barrels of rum -- so much cargo that some customers could not be accommodated. This is our biggest cargo so far from the Caribbean. For the first time, the coffee to be roasted is Tres Hombres Coffee, with our own roaster." He added that German filmmakers are finalizing Ready About: Return of the Windjammer. It will air 14th May on GermanTV, then will be screened in English at an event in Falmouth, UK, then in Amsterdam for the premier. It is 45 minutes long, and is on sail transport in general. It follows up the documentary Tailwind from Europe that aired on Eurovision [YouTub.com]. The trading smack Nordlys is wooden and was built in 1873. The Fair Transport team is keeping the old diesel engine for now. Translation of Nordlys : Northern Lights. It has a cargo capacity tonnage 25 now, but can be expanded to go as high as 40 tons. Length is 21 meters, in ketch rig, eleven meters less than the Tres Hombres schooner brig. On Feb. 23rd the work on refitting the vessel officially starts, although floors and hatches are now being opened, and the team is removing ballast. The outlook is one year for completion. The use of the ship for sailing cargo is trade along the coasts of Germany, Norway, Portugal, England, and France. The ship has been hauled out only briefly before, so in order not to dry it out too much, there will be a tent, with entry in and out of water. A Business Case -- a book with description and workings -- is available. The Prospectus is in English only, a departure from the Tres Hombres process that involved only Dutch. The total refit budget of the Nordlys is 300k Euros, with "less shares the better for the costs to be kept down. Volunteers are now being selected," according to Jorne Langelaan, one of the Tres Hombres who spoke with this reporter. Capt. Jorne added that more ships are being sought, and one may replace Tres Hombres' transatlantic route. He said that the Tres Hombres can thereby sail to the Mediterranean(!). "Nordlys will make the whole Fair Transport process more well known, and people around the world will want to utilize sail transport." A final word just for the readers of Sail Transport Network from Capt. Arjen van der Veen of Fair Transport: "The revolution has just begun!"